Goal – To pull numbers from a hat, place the number in the right spot by estimating the price of the prize. If they get the price correct before getting 3 strikes they win the prize. Rules – The player is offered a chance to guess the price of a big prize by reaching in a hat that contains 8 chips consisting of 5 numbers & 3 X’s(strikes). If the player pulls a number they will estimate where the number should be to complete the price, if they place the number in the wrong slot they will place the number back into the hat and redraw. If the player pulls an X that chip will be placed a strike slot, the player will continue to draw until they get the price right or 3 STRIKES. Core Mechanics – It is a game of chance and calculated estimations, the player must consider the value of the prize and estimate where the number may go, if wrong they must recalculate and remember previous moves. Components – A hat/bucket/object to hold the chips, 8 chips(5 numbers & 3 X’s or strikes), a board to place the numbers and strikes, a good vision of the prize and a monitor/host to move the game along with knowledge of the prize’s value. Space – This will consist of a board with spots for numbers and strikes. a picture of the prize, a stand for the hat/bucket and room for the player to move between the two. Awesome Game – modifications for this game I might consider providing a bit of info on the prize at hand which will allow the player to better assess the game……. In my group we decided to modify the game called “The Card Game” used by Mr. Anderson and my suggestion was to enhance the value of the cards that the player would draw, this would speed the game up but also put the pressure on the player to estimate the value of the prize and make a faster decision. In our group we all brainstormed on modifications that we could make to the game however we did not have a chance to play the game with the modifications. Rules: The rules of this game are as follows. First the contestant must pick a card randomly. The value of this card shows the number in which the contestant must fall within compared to the actual price. The contestant then begins picking playing cards at random. Each card has a numerical value (1=100, 2=200, Jack Queen King=1,000 Ace= wild card). The contestant picks as many cards as they want until they feel they are within range of the value of the prize. Core Mechanics: the player reveals the card they randomly selected and the value of all cards collected is added up. Modification: A modification I would make to this game is to increase the skill required and decrease the luck. In order to do this I would place the cards on a dart board. The contestant would be able to see the value of each card. The contestant would be required to throw a dart at the card value they want. Contestants would have a limited number of trials. Rules:The rules for this game is simple. It starts with two locations and each location has a price that has already been reduced. The goal is to figure out which location has the bigger bargain based on the difference of the reduced prices. Description of the game: I had one card saying a 7 night stay in a hotel with concert/event for $4,000 and the other was a 6 night stay in a resort and spa in Paris, France with a tour through France for $6,000. Both were already reduced prices, but the contestant would have to figure out which location had the bigger bargain, was it the $4,000 location which was originally $6,500 but had $2,500 taken off, or was it the $6,000 location which the original price was $7,000 but had $1,000 knocked off. Mechanics: For this game it would be guessing which of the two locations has the bigger bargain. Space: There are no spaces, just me holding the cards and pictures. Modification: My part of modifying Uzma’s Bonkers Price is Right game in which the player has 4 numbers and has to guess if its higher or lower than the number on the board, and that once the player has got which ever number right the first time, I close that section as a clue to the player that he or she leaves it as is and moves on instead of going back and changing it which is the original way of playing the game. Description of my mockup: I searched for the cost of 8 products that I had drew on a paper. On the reverse side of the paper, I wrote down the price of each item. Then I crafted a cylinder out of paper and placed a few pieces of paper inside of it. Each piece of paper contains a number which represents the value of 3 products. Modification: Our group decided to modify the Credit Card game. My suggestion to the modification is a rule change. It’s a slight change but I thought it would make the game a bit more challenging. The same rules apply except that the total price of the items shouldn’t be below $100 from your credit limit. A few of the items that I drew are similar in price so this makes the game much more interesting in my opinion! If you guess the right amount you win all eight prizes but if you go above, you get nothing. When all the letters are gone, and if you’re the first to finish your crossword you say ‘bananas!’ and win. I love this game vs. Scrabble which tends to be much slower as you deliberate over your seven letters trying to find a place for them on the board while maximizing points. 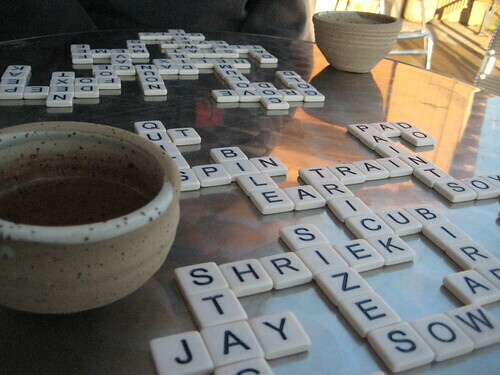 Bananagrams on the other hand is very fast, there are no points assigned to each letter, you just have to make words. Also there are two other changes to Scrabble – you can rearrange your crossword at anytime as well as dump a hard letter (such as a Q or Z) and take three letters. Both of these rule changes foster speed in Bananagrams. This is a great example of a modified game that led to a very successful product. Many of the games we play are modifications of existing games or game systems – think of how many card games there are out there – practically an infinite number. To finally get started on your educational penny arcade game, I want you to research an existing game and start tinkering with the game rules and mechanics. We’re going to look at the core components of a game by looking at The Institute of Play’s Gamestar Mechanic Learning Guide. Then we’re going to rebuild a paper/pencil mockup of a game found on the List of The Price is Right pricing games. Search for video of the game you chose (it’s likely out there on Youtube), and then define it’s five core design elements. You’ll next have to translate the game into a paper/pencil mock-up. So if there is a wheel spun that has five choices, then recreate those choices on five slips of paper so they can selected at random. Next follow Modifying Games exercise on pages 51-54 with a group of three. Choose one of the pencil/paper mockups to modify and each of you must choose either a rule or core mechanic to change (see worksheet on page 54). Everyone should play based on your change. Report out the results asked for in the modifying a game exercise. Embed a video of the original Price Is Right Game. Define the five Core Design Elements of the game. Document the pencil/paper mockup you created and embed images/video. Describe the mockup as well. Share the report of your modification to the group game.